Victorian communities expect their cities and towns to be liveable. 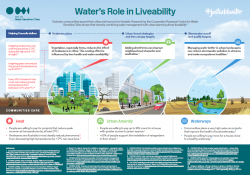 Research by the Cooperative Research Centre for Water Sensitive Cities shows that cleverly combining water management with urban planning drives liveability. This factsheet visually represents the numerous ways that water management contributes to a city's liveability.